Organic Blueberries were on sale last week so I loaded up on them as that doesn’t often happen. 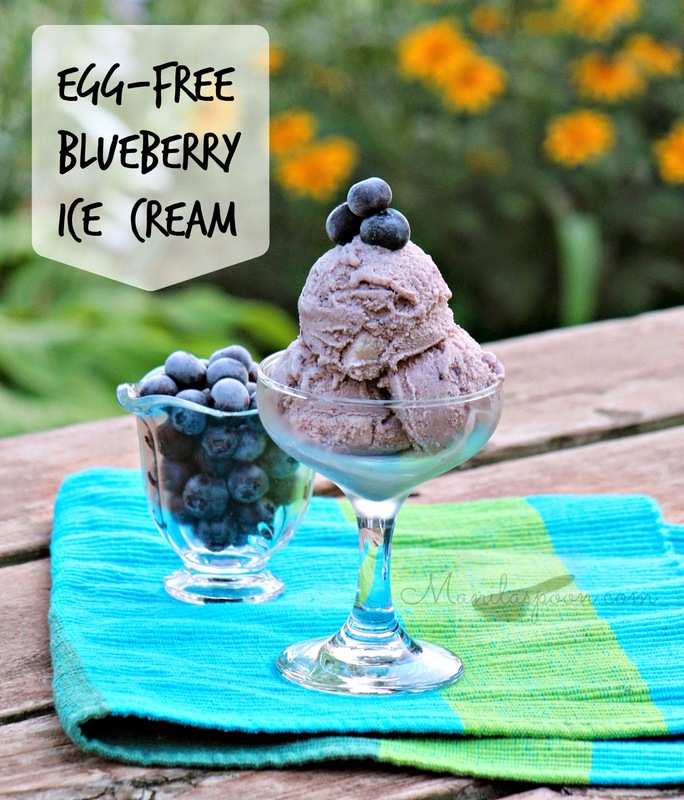 I decided to make some Blueberry Ice Cream as I made an egg-free version last year which the whole family enjoyed. I think summer was already over when I made it then, hence, I didn’t immediately post the recipe but thought I would wait for the appropriate season. Puree the blueberries. Strain. Measure about 1 1/2 cups. Combine the half and half, heavy cream, sugar and salt in a mixing bowl. Mix using a wire whisk until the sugar is dissolved. Stir in the pureed blueberries and vanilla. Pour the mixture into an ice cream maker and process according to the manufacturer’s instruction. I usually churn it for about 20 minutes on mine. If you don’t have an ice cream maker, pour the mixture into a freezer-safe bowl and cover. I use a metallic mixing bowl and cover it with foil. Place in the freezer. Take the bowl out every 30 minutes thereafter (for at least 3 hours) and stir the ice cream using either a whisk or a handheld blender or beater. It is necessary to do this to prevent ice crystals from forming. Freeze the ice cream overnight or until hard. 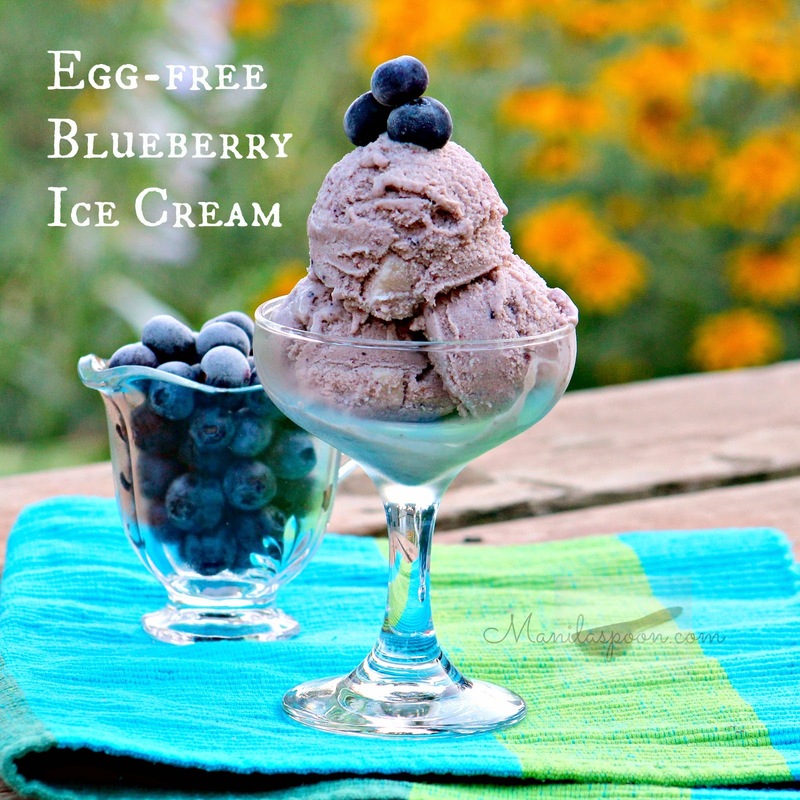 Enjoy this egg-free and truly creamy-licious ice cream! If you wish to print the recipe, there’s a print-friendly icon at the end of the post. Click on the “remove images box” for easy printing. If you like what you see and would like to receive new recipe updates, we’d love you to subscribe to our posts or join our site. Needless to say, we’d love you to like us on Facebook too where you can get more recipes and updates. Thanks and happy browsing! Thanks for this wonderful post. I love this. I love blueberries, it looks absolutely amazing! Thanks! We love blueberries a lot, too. What a fantastic idea to make your own ice cream! I love the idea that you can did it without an ice cream maker, perfect! It's easier to use an ice cream maker but definitely not hard to make it by hand. Thanks Florian. You know, I was just thinking that I need to try making blueberry ice cream. We have a friend who has about 100 bushes and lets us pick all we want all summer so I always have frozen berries in the freezer. I need to use them up as it's almost time for the fresh ones to be ready for picking. Pinning the recipe so I can make this. I will replace the sugar, though, with a low carb substitute. Thanks! I only make egg free ice cream – for no other reason than I am lazy. this is perfect! I can relate to that Pam, I don't wish to bother making a custard first as it's as yummy without it. I've never made my own ice cream, but with summer coming, I HAVE to try it! It's so easy so definitely worth a try Rebecca. I've never even thought to make my own ice cream, but I'm surprised at how easy your recipe makes it Abby! I'm going to try this soon, and in the meantime, pinned! Thanks, Cyrus! With your cooking skills making ice cream is really nothing…so easy. 🙂 Recipe is adjustable to one's taste preference, too. Yum! This looks delicious and I will definitely be making it with my next batch of blueberries. It is my pet peeve when ice cream recipes have eggs in them, I prefer the prep and flavor of egg-less ice cream recipes, thanks! So much easier to do and great-tasting, too. Thanks Emily! 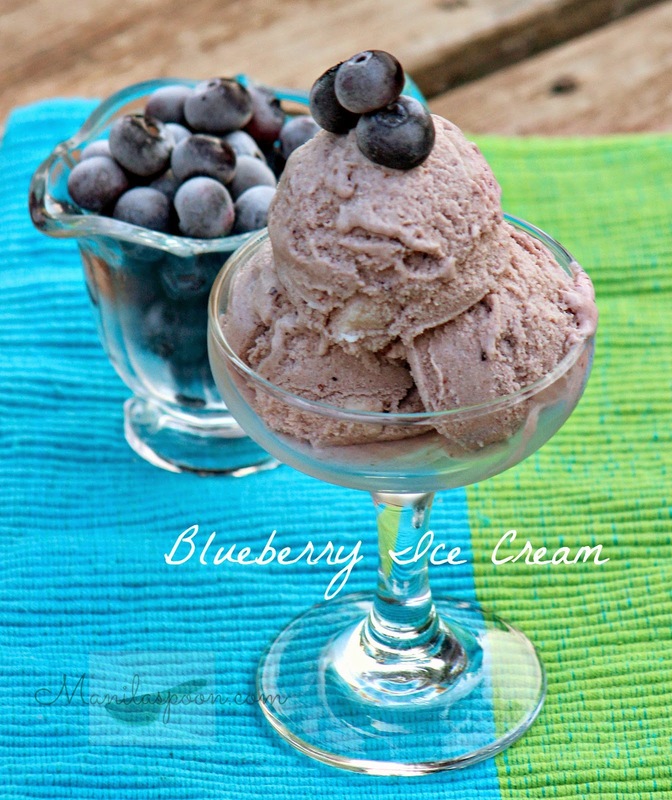 This blueberry ice cream looks amazing!! !